Hope you've all been staying cool on the hot days in January? We have uploaded today the Feb 2013 events calendar which you can get here in PDF format. There will also be hard copies available at The Water Wheel - hopefully in time for Australia Day this weekend. 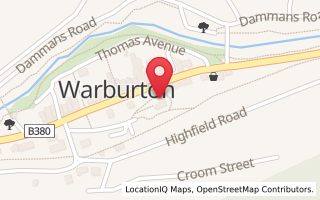 In addition to all the excitement planned for February, including the annual Warburton 'Up and Running' fun run on Sun Feb 24th - and the Warburton Forest Village and Valley Festival on Feb 22, 23 and 24 - we've had a tree fall. Not just any tree, reports are this giant mountain ash is 200 years old and when it came down, it came down with a thump. Making front page news of the local paper this week, Warburton has a new tourist attraction across the river behind the playground and shops in the main street. 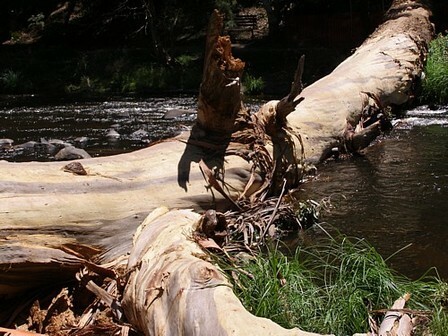 You can still park in Thomas Avenue no problems, but this tree will now sit proudly across the Yarra River of Warburton - until the powers that be decide if it should be moved or left in place. Next time you're in Warburton - have a look. What a whopper! Jan 18-29, 2013 - Fabric Frolic - The Patchwork Teahouse is part of this annual event! Address: 3409 Warburton Highway Phone: 5966 4500 Melway Reference: 290 B4 Tuesday - Sunday 11am - 4pm Others days/times according to programming... January - Art Space open at The Water Wheel.